So have you been following along over on the Verve Blog? It's Project Parade Challenge Time--this time it's for Anything But a Card! 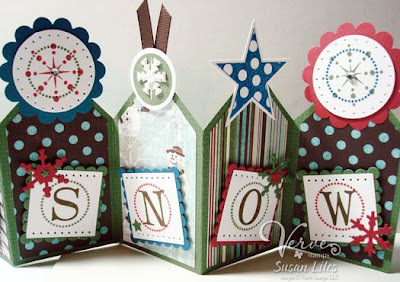 I'm so excited to share my Anything But a Card Project Parade creation with you today! Ever since I saw THIS Accordian Tag that Sharon Johnson of No Time to Stamp? made (hi Sharon! ), I kept going back to look at it over and over again just to stare at it in awe (and wondering just when the heck I would have time to make one for myself!). I just love it! So I knew this assignment would be the perfect "excuse" to sit down and create one to add to my family's Christmas decor this year. I did take Sharon's advice and picked a shorter phrase (LOL--wink! ), but her instructions were super easy to follow and pare down for my needs. I used both of the new snow related sets from Verve called Snow Wonderful and Snowflake Splendor and even pulled out an old favorite of mine (one of my first Verve sets, as a matter of fact, and still a favorite), Polka Stars (makes me want to dance). I kept adding and embellishing until I found a "happy stopping point" and I am just pleased as punch over how it turned out! 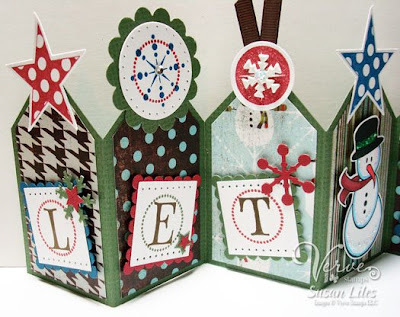 I truly hope you get a chance to play with us in our challenge...I had been craving a "project" to work on as opposed to a card and this totally fit the bill! Wanna play along? All you have to do is create Anything but a Card and link up your creation to THIS POST by noon on Friday, December 5th. You don’t have to use Verve Stamps, but if you have them, why not give them some love? If you upload to SCS, please use the keyword VVPP08 so we don’t miss your eye candy! A random participant will be drawn on December 6th to receive $15 in Verve Bucks to spend at the Verve Stamps store! Good luck and have fun! 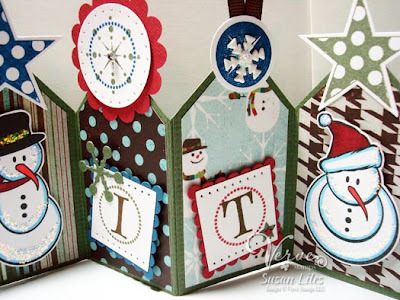 SUSIE Q-TIP: When using any kind of stickles or glitter glue, you may want to squeeze a little out onto a scrap of cardstock to make sure the "shine" of the glitter matches your project. This is especially true when using it over a colored surface. It tends to alter the color of the glitter effect a bit. For instance, a "holographic" toned glitter may not work well with a "distressed" project. Sort of like picking a type font--it needs to match the "feel" of the project. This is just wonderful -- I LOVE it!!!! So full of fun!!! Love your colors and fun patterns all combined together!!! You make me want to try another in these fun colors!!! Thanks so much for sharing!!! This is so awesome...you shouldn't have. I can't wait for it to arrive on my doorstep...hehehehe!! Oh, wow!!! I just love this accordion tag. It's so fun and festive! Wowzers! This is fantastic! Love the colors and papers you used! Well, Susie, this is GOR-GE-OUS!! I'm going to try it over this long week-end (I'm off Friday except for phone divert). I think I've got plenty of paper and stuff to make it!!! Take my breath away-ay-ayayay-ay! :) Absolutely fabulous project Susan! OH MY!!! i can't believe how AWESOME this is!! beautiful, the colors, paper, attention to detail...i fully LOVE it! i just dropped everything i'm currently working on and started my own! thank so much for sharing!! this is so ubber cute..that is surely a nice addition to your xmas decorations..TFS..Liann M.
This is adorable! Thanks for visiting my blog!!! cute job on the banner...love how you decorated it! very cute! happy thanksgiving! SUPER cute, Susan!! I LOVE it!! This is so freakin' awesome, Susan!! I love love love it!! Oh my gosh - this is amazing Susan! I love it!